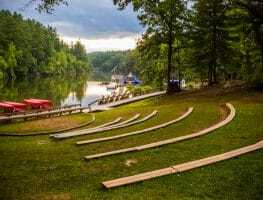 Camp Pinnacle occupies 126 acres of majestic forest, creeks, fields, and large, private 20-acre Wolfe Lake. 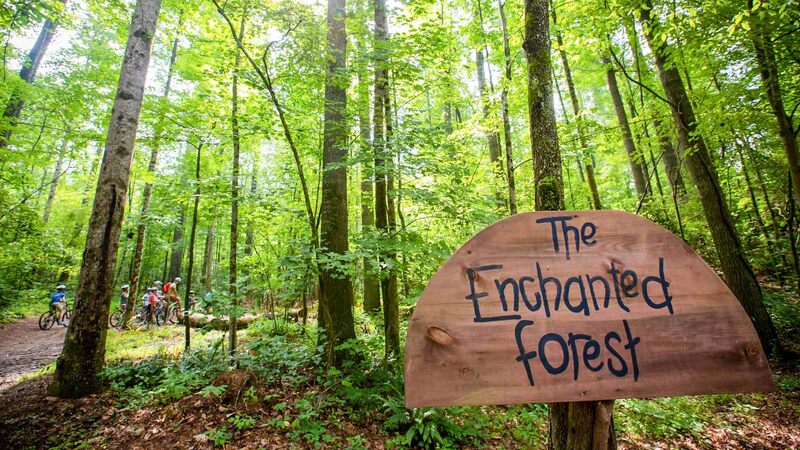 This magical atmosphere remains lodged deep in the hearts of many generations of campers. We’ve been busy updating this iconic place since our re-opening in 2012, and every month brings exciting renovations. 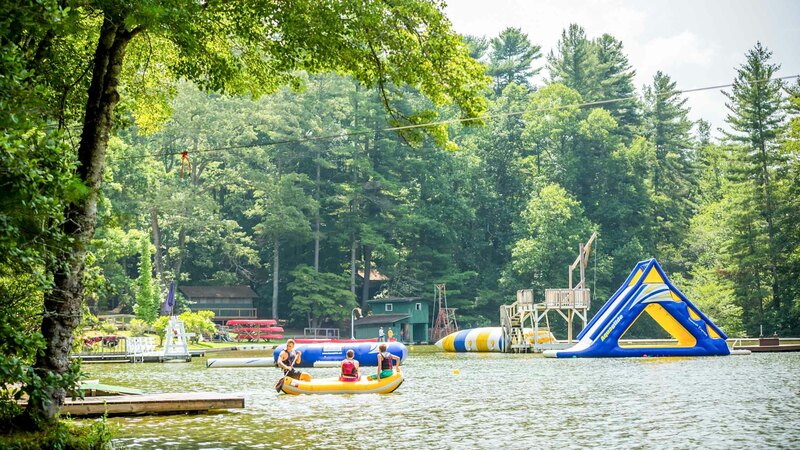 The best way to experience the magic of Camp Pinnacle is to schedule a visit and see for yourself. Call us at 855-378-1928; we’d love to show you around! 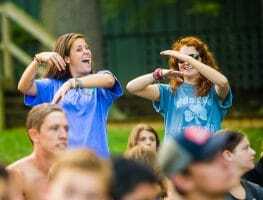 If visiting before camp isn’t an option, we invite you to download our camp map here. Camp Pinnacle is a wonderfully supportive place where kids can build real world skills, such as independence, responsibility, and resilience. The facilities are amazing! Built in the 1920s, our cabins are rustic but comfortable—and newly updated! Cabins house eight to 10 campers and two counselors, and each have a newly built porch. All are in close proximity to our renovated bathhouses. 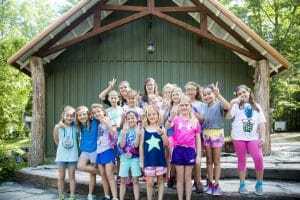 In 2016, the girls’ cabins (named after our region’s beautiful rivers) received a fresh coat of paint, new lockers, and refinished flooring and siding. 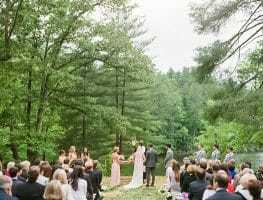 The two youngest girls’ cabins, Hiawassee and Tuckasegee, have a built-in treehouse and swinging bridge, and are closest to the bathhouses. 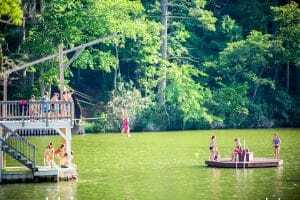 Nantahala has a firewoman’s pole for a quick and fun exit, and all the girls can enjoy two different Hammocklands and a special “girls only” area for socializing. 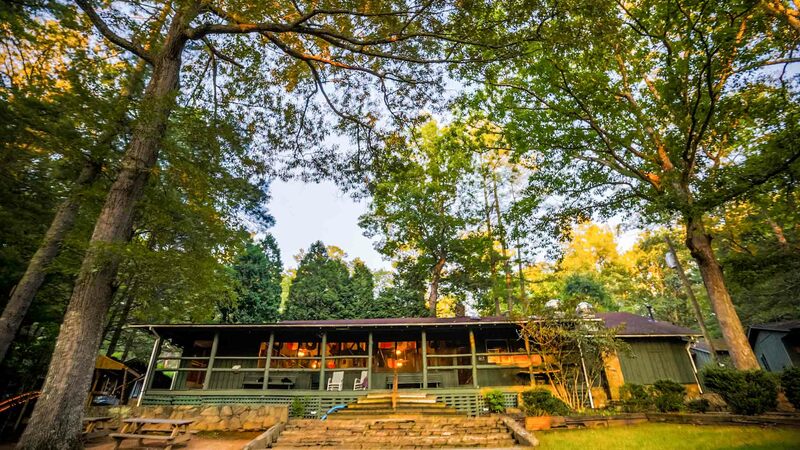 The boys’ cabins (named for the Blue Ridge Mountains’ most scenic features) have also been recently restored. 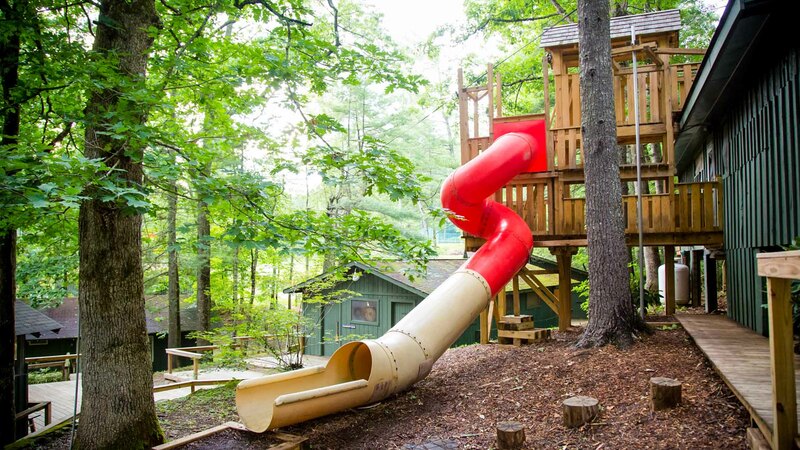 The two youngest boys’ cabins, Panthertown and Eagle Rock, have a treehouse, slide, and fireman’s pole. The boys’ cabins sit close to the game room and mini-golf course. 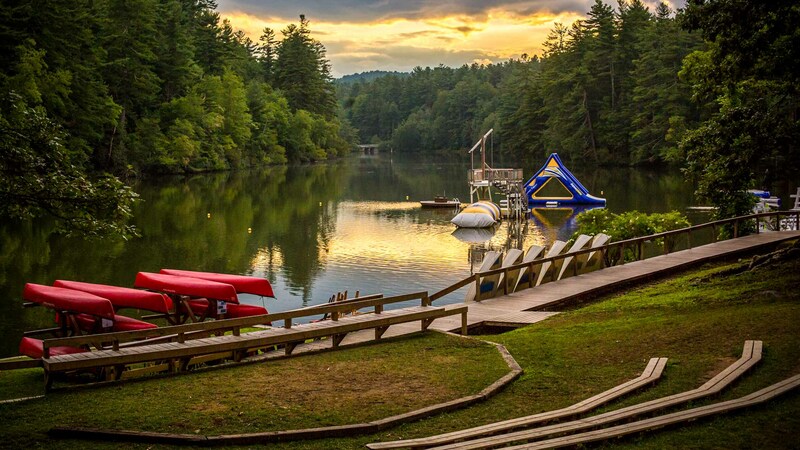 Many campers will say this is their favorite spot at camp! Campers can explore the perimeter of Wolfe Lake from stand-up paddleboards, kayaks, and canoes. Splash around the waterfront on the white sand beach (a prime spot for Evening Circle) or play beach volleyball. 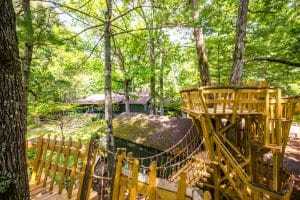 There’s also a rope swing, blob, AquaGlide, water zipline, 200-foot mountain slide, fishing dock, water trampoline, lily pads, and a monkey bridge! Wolfe Lake is fed by five mountain streams and several underwater springs, so the water refreshes itself every few days. We professionally manage our lake ecosystem and monitor water quality, and we control lake temperature through aeration so the it stays in the mid- to upper seventies all summer long. 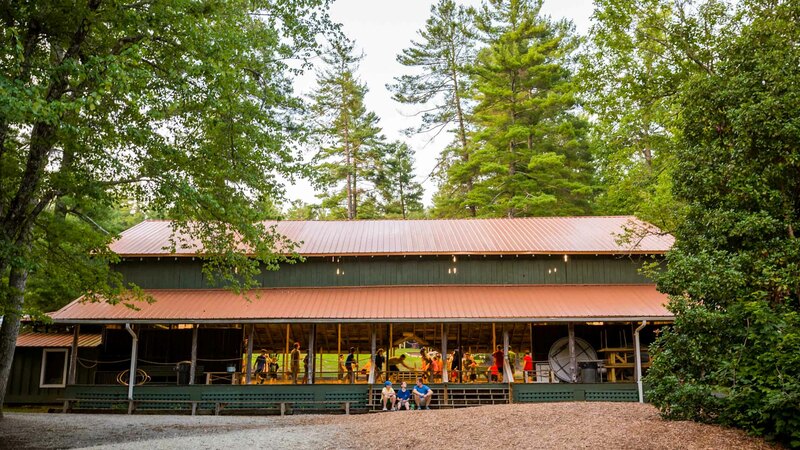 The dining room may be the most popular place at camp, which was completely rebuilt in 2017! The new building emphasizes the same rustic feel of camp and helps us observe our time-honored traditions. 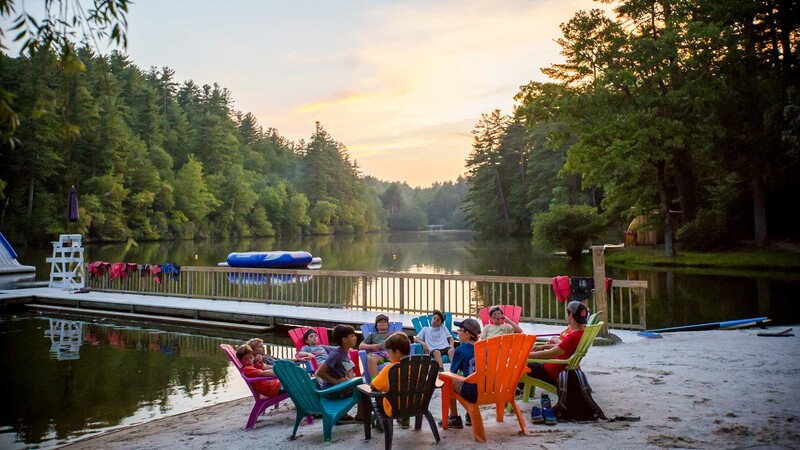 Our campers have enjoyed the modern design, the greater ease of coming together, more elbow room at the table, improved ventilation on a warm summer day, better views of Wolfe Lake, and much more outdoor dining space! Nothing says camp like sitting around a fire with your friends. 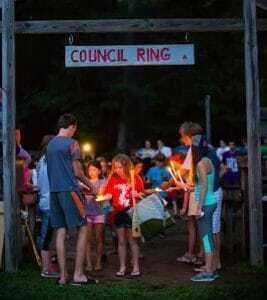 We gather in the campfire ring during Evening Programs and Circles, and on Opening and Closing Days. 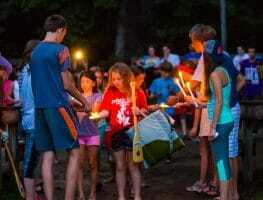 At the closing ceremony, you’ll have the pleasure of watching campers singing “Pinnacle Kids” at the top of their lungs and hearing their words echoed back to them over Wolfe Lake. The waterfront gym is our best gathering spot for games, talent shows, dance parties, performances, and other special activities. The open-air concept gives us a dry place on a rainy day, or a shady place when we need a break from the sun. Reach new heights at the climbing tower, which will be completely renovated for summer 2018! Our campers will prepare for Gilbert’s Rock by practicing on the many different climbing routes on the tower. The routes range in difficulty for every ability. Alert camp that you’ve succeeded by ringing the bell at the top! 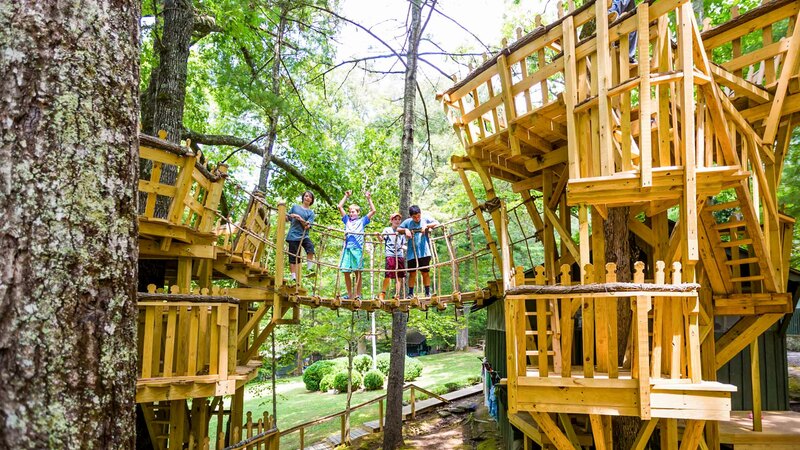 New for 2018 came our state-of-the-art treetop aerial adventure park called the Sky Park that features 28 different airborne elements. 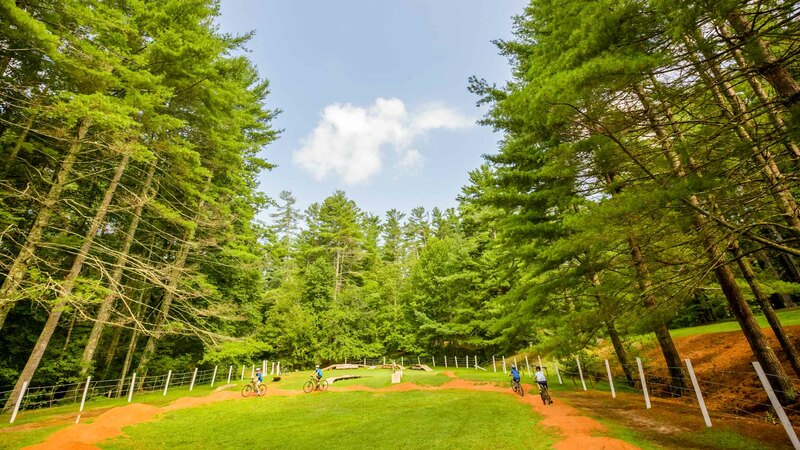 Its unique, non-linear design means an entire cabin can participate at once, and campers will be empowered to try a different route and sequence every time they climb up. 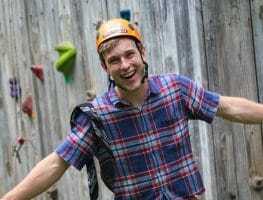 A special belay system keeps everyone safe while allowing campers the freedom to choose their level of challenge. Read more here. Our gorgeous Arts Center debuted in 2016. Light, airy, and spacious, the Arts building provides ample opportunities for campers to let their creative selves loose. Our Health Center is home to our wonderful nursing staff. 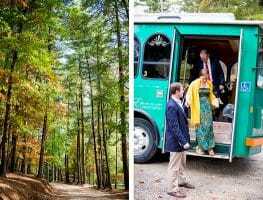 There is a general medical room and private examination room, as well as additional private rooms with beds should a camper need to stay the night. This is also where daily or as-needed medication is dispensed. Sick call is before meals and at nightly call to quarters, but our nurses are at camp 24/7 in the event of an emergency. Dr. Morris, our family practitioner, makes rounds as needed.